Published on 21 Oct 2012 at 7:32 pm. 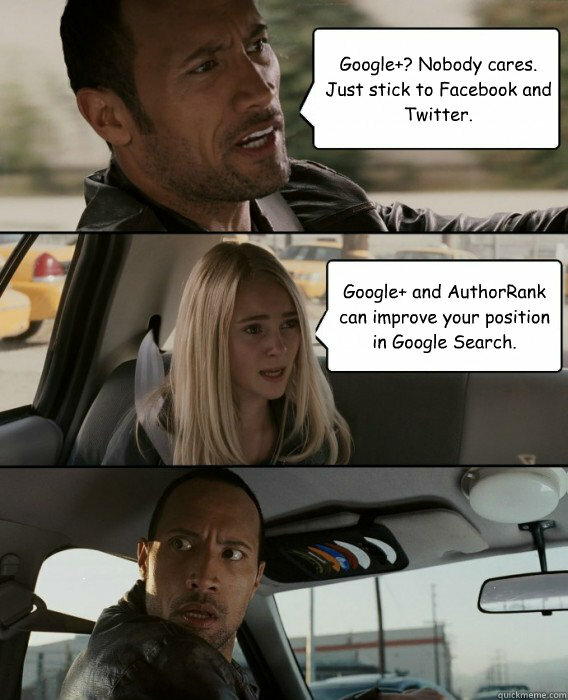 The impact of Google+ and AuthorRank will rock you. First let me start by stating that I am not talking about Amazon’s Author Rank. That is a new service Amazon has started where it is ranking best-selling authors. The purpose of that is to help users find quality books in various genres. AuthorRank is a term the SEO industry extrapolated from Google’s Agent Rank patent. In simple terms it uses the reputation of content creators to influence search results. An author’s AuthorRank can vary depending on the topic. For example, I often discuss web development and social media marketing. My AuthorRank on those subject is high. My AuthorRank on billiards is low because I rarely play or talk about it. AuthorRank differs from Google PageRank in that PageRank is just a measure of content. It is not a replacement for PageRank. It is another resource that Google uses to find quality search results. Authorship markup is necessary to tell Google of the author of the work. It is a rich snippet used in search engine optimization. Authorship markup connects to Google+. This means that you cannot ignore Google+. You need to build your profile and show that you are an active user. Spend some time on it each day. Follow brands/users that you care about. You need to comment, +1, and share articles. Make sure you fill out your profile as well. Link to the profile page on your other social media networks and the author page on your blog. The introduction section even lets you add links to things. You should add a link to your company’s homepage. I would suggest using one of the keywords for your site. There are those within the SEO industry that question whether AuthorRank has already begun. Those doubters aren’t questioning that it will happen. They have seen evidence that it has started. Search Plus Your World is a great example. The distinction is pointless. Get started now. What does AuthorRank mean for a brand? Brands have to accept that people matter. They need to highlight the employees that are building their brand. I recognize that this is a tough sell for some companies, but it is the new normal. Google is not the only company going in this direction. Twitter has begun this practice as well. More on that in a future article. The obvious concern with highlighting employees is that they may become bigger than the brand. The knee-jerk reaction to them leaving would be to nuke all of their old content, or attribute it to another user. Don’t do this! AuthorRank carries from site to site. Say you’re third place in search results for your industry and your employee left for the fourth place company. At this company they create killer content that actually brought them in to first place. Because their AuthorRank will have improved so to will the pages on your site. You could move into the second place because of the content they previously created. Your competitor improving themselves just dragged you upwards with them. Now of course, Google is smart enough to tell who is gaming the system. Don’t have your content creators make special accounts to just post your. You need active members of a community. You should encourage your employees to spend time on social media networks throughout the day, but you’ll need to watch their activity. Posting a comment on an article on LinkedIn would be acceptable. Liking a cat picture on Facebook would not. This post was originally published as AuthorRank — Or Why You Cannot Ignore Google+ for The BrandBuilder Company.